Designed for the over 60s and set in an ideal location with the town centre nearby this one bedroom ground floor apartment enjoys direct access to the gardens, spacious lounge/dining room, kitchen plus residents and visitors parking. SITUATION: The property is situated in this popular residential location giving good access to the town centre with its good shopping facilities, main line rail service at nearby Jarvis Brook together with good bus routes. Recreational facilities include the Beacon Golf Course, Boars Head Golf Course and floodlit driving range, Crowborough Tennis & Squash Club and Crowborough Leisure Centre with indoor swimming pool. The spa town of Royal Tunbridge Wells with its more comprehensive facilities is about 9 miles distance, whilst the coast at both Brighton and Eastbourne can be reached in about an hours drive. BATHROOM: Enclosed bath with shower over and grab rails, pedestal wash hand basin, low level wc, part tiled walls, vinyl flooring, chrome ladder style heated towel rail, wall mounted electric heater, extractor fan. 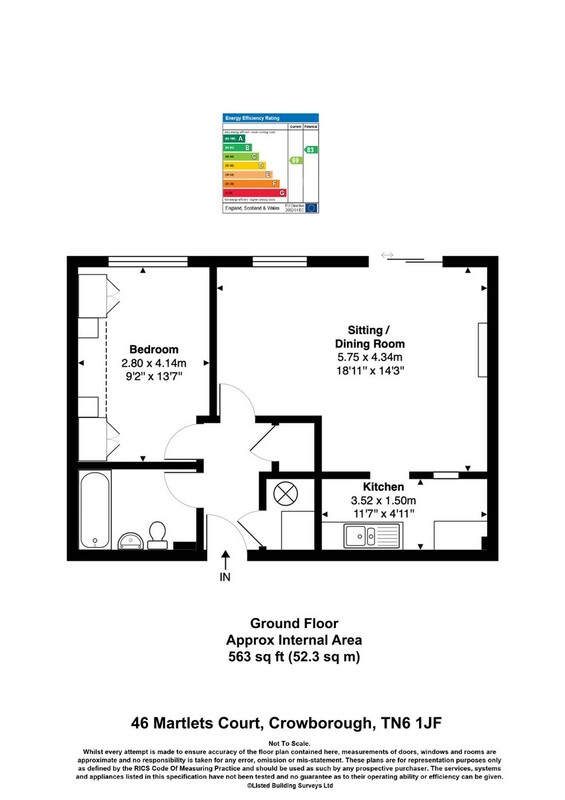 BEDROOM: Fitted storage cupboards together with bed side tables, storage heater, power points, double glazed windows to front with tiled window sill. KITCHEN: Range of matching wall and base units with work surfaces, one and half stainless steel sink bowl and drainer, tiled splashback, space for freestanding oven and fridge/freezer, vinyl flooring. OUTSIDE: Small area of outside space with flower borders and small brick patio, ample parking for residents and visitors and use of the communal gardens. AGENTS NOTE: On site Laundry and Communal Lounge.